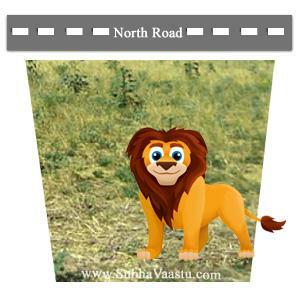 Vastu for Sites | Piece of Land | Vacant Areas | Ground: For our happy living purpose and our children secured future, everybody should buy one Home (Home vastu)/site /plot. Generally, these sites may be bought for our dream home construction or for investment purpose. Due to residents financial position, many inhabitants may buy only one plot in their life time. So its always better to implement the practice of Vastu Shastra guidance before buying the plot or site for house construction. We should be cautious and vigilant in the selection of the plots/sites. This chapter deals and interstitial in detail with the shape or size of the Plots or sites and their impressive results on the occupants. This link explains the sites which are compatible or incompatibility with vastu principles, we tried our level best to publish the vastu knowledge in this link. We should not forget that our dream houses (House vastu) are to be built there and we are going to live there for years together with our loving family members, if we missed following Vaastu shastra principles, then we may miss something. There is a proverb in Tamil and Telugu that says, “The construction of a house and celebration of a marriage will give a lot of experience that one never forgets in his life. It is to be understood that RAJA YOGA or Luck of the house, begins with the selection of Plots / Sites. 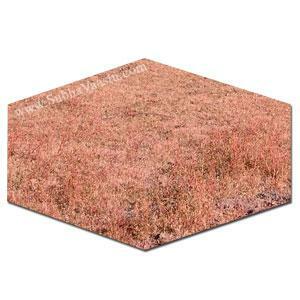 A good selected plot makes the house construction an easy task and the whole work will be completed in time. 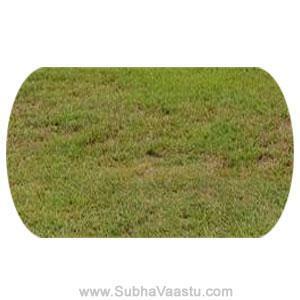 If we decide a plot on the advice of a Vaastu specialist, the major portion of work is completed. Vastu News: Andhra Pradesh was divided into two regions, one is known as Telangana and another one is called as Seemandhra (Rayalaseema and Kostha Andhra), however this state name remains same and known as Andhra Pradesh. Telangana First Chief Minister is Sri. Kalvakuntla Chandrashekar Rao (KCR) and Andhra Pradesh First Chief Minister is Sri. Nara Chandra Babu Naidu. The fortunate factor is that no roaming charges for cell phones in both states. If Telangana user may be visited Seemandhra area he might make use of the mobile phone without roaming charges. If Seemandhra person visits Telangana, he might use his mobile phone without roaming charges. Because of the Government Policy, thanks to the Government. Now coming to the point, the shapes of Telangana and Seemandhra are now more interested for the discussion, a few vastu pandits are saying that Seemandhra has increased/extended towards Northeast and Telangana loses Northeast. Let us check both positions in future within 5 to 10 years. Which state will gain and which state will be more powerful. Is vastu works for the states also? does these both states have barriers or compound walls. 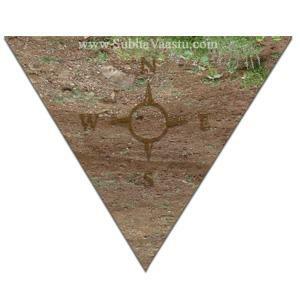 Is vastu works on shapes on the Maps also? generally, vastu requires boundaries or barrier, let's examine what's going to occur within a long-term say about 5 to 10 years of the period. 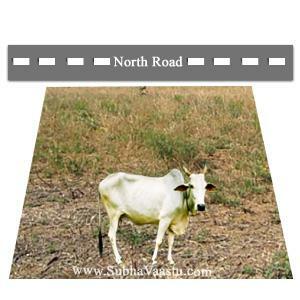 The fact is that vastu always requires a barrier or walks or moments. If a state becomes more developed and richer and more shine then the controller or Chief Minister residence and administrative offices and other ministry council body members properties should be built according to vastu shastra, then there are great hopes of positivity to their respected states. This is true. A good Vaasthu plot brings the labor, the supervisor or Engineer, and the expected finance, at the appropriate time and assurance of early completion. This also fetches good FORTUNES to the occupants of the house/building, definitely. One could see (in their area), many plots with half constructions. Further, in some cases, works are delayed for months together or years together. The reasons may be different, out of them the OWNER has sufficient money, the construction works will not moving as per the expectation. Wastage of money also becomes inevitable in the construction of houses due to FAULTY or BAD SITES. If the four sides are equal like a square, it is called a square plot. These plots are called as CHADUSTAKONA PLOTS. This is best suited for any construction. These plots have maximum magnetic and Cosmic Energy. These plots bring happiness, riches, and health to the occupants. This site/plot is in the square shape if the resident wishes to buy this plot, the strong advice is immediately to consult one experienced Vaastu consultant to have a good plan suitable to this plot for future improvement. In case some residents thought that they know all Vastu techniques and taking chances in life then they move for the registration of such plots. Generally, this kind of sites bestows luck to the inhabitants, doors should be placed in the right place according to Vaastu shastra. If doors are not correctly placed at right place then the plot may not provides happiness and prosperous to the residents. 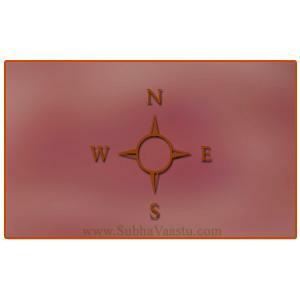 Generally, square plots or sites are good in providing results, but should not forget the main and most important point is that it will provide the good results only if it is 90° otherwise the results may vary, for further results on degrees of the plot, see Vastu Directions link here. 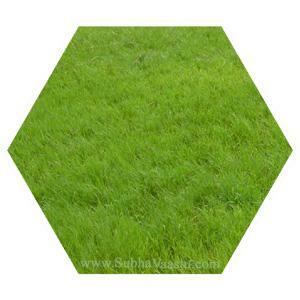 These plots are called ‘AYUDHA’ plots. This brings more fortunes and riches to the occupants. But, the length should be in the proper ratio of 2:1 to width. Some literature says that if the length is more than twice the width, then plots are not auspicious, as there will be imbalance of Cosmic Energy in the plot, but in our experience, we see lots of properties which enrich with more money, luck, name etc when it crosses the 2:1 ratio. No need to believe our words, one may also observe the system where the property has good vastu and crossed 2:1 ratio is bringing the light to the residents or not. In Delhi, for example, Karol Bagh area, there are lots of properties either commercial or residential, running huge businesses and become richer. We personally observed many properties in Karol Bagh area Hardyan Singh Marg, Gali Number 7, 6, 5, 3, 2, 8, 9, 10, 11, 12 . . . 55 . . . 65 etc. Street number 3, 8 etc. 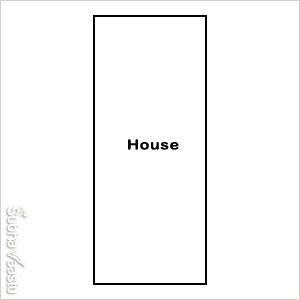 This is the rectangular shaped house/plot. Length is more than the width. Already we discussed 2:1 ratio. If the reader cannot understand about this logic then they may please read in the above para. Door placement is most important to this house/plot. If the main entrance is not property placed at correct place according to Vaastu shastra, then the residents may face troubles, they may always be looking for others help. If you found this plot is not perfectly 90° then better to consult one experienced Vastu consultant before buying the plot. This is the right idea and perfect way of selecting the plot with the help of Vastu Expert. Many residents now selecting the plots by knowing half knowledge Vasthu and finally getting into troubles, knowing the information is different and practical knowledge is purely different. Rectangular shape sites are good sites, no worries at all. 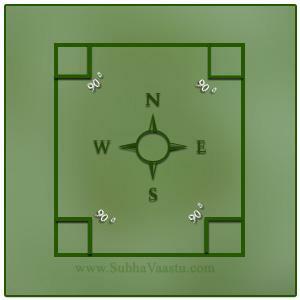 But the entrance should be according to vastu principles, we must check the surroundings vastu before buying the sites. It is an important aspect in Vaastu Shastra. The South direction of this site has to be occupied by others, if not plant trees there to minimize the negativity from South direction. Residents are investing their hard earned money on properties so it is always best to have one best expert vastu consultant advise before taking decisions. Consultants fee is very very smaller than what residents invest on their properties. The one and the only problem is the residents are looking at the vastu pandit fee in excluding the property cost. If the resident added this consultation charges into the property cost, then all will dare to take vastu consultancies. It's a simple and easy technique to come out of some feelings. The intelligent and wise people always have the consultancy before buying the properties. Two things we should not forget before buying the property. 1. Vastu Consultation. 2. After this vastu process consult one legal adviser NOTE before buying the property, check all legal issues before signing the documents. This is also most important for future security. There are some other plots which may be called "oblong" ones, here the measurements are too vary or the length is heavier than the width and somewhat the corners may not be the unequal adjacent sides. When we studied the architecture of the buildings the linear architecture is the best out of many. The cities that followed linear architecture and rectangular lots, straight roads, picket fences, and rectangular buildings are the most successful in all countries in this entire World. USA and Canada followed linear architecture. 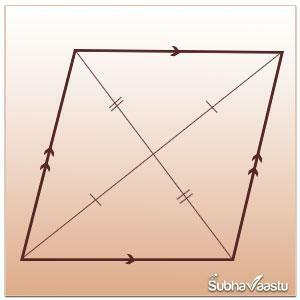 As said by some vastu people, rectangular plots are not bad. When in our study we found rectangular homes brings more luck. The very most important point is that residents should check thoroughly about 90° of the plot, if its not 90° then it is mandatory they should show that property to the expert and has to take the decision. Good Luck. The land which has many qualities in different areas, states, countries. We are accustomed to living in one area, we may be called it as attachment or love on that area or people who loved there. Sometimes we never leave some areas, because of attachments or affection on that area or neighbors. Somebody vex with few areas and they wish to move from there. Anyway, peace is the ultimate destiny to have the life with satisfaction. We have divided the sites into four categories. In this page, we planned to discuss on each and every available site, maybe some are not live or not available in our society, but we are discussing them here. Thereafter residents may decide to buy or not to buy. We are publishing the vastu content matter here, it may help to find the good properties in different localities, but it is strongly recommended that one should approach an expert vastu consultant and then only take the decision to buy or not to buy. Generally, residents have a big doubt that Which Site is Good for them. As per astrology somebody interested to have East and North facing properties, somebody may be interested in South and West properties. Even many astrologers are saying after checking the Astro chart and decides to buy only East or North facing homes/plots. We have discussed the sites and Directions and Residents Horoscopes. Now coming to the point, all directions are good (except for some conditions on Southwest, Southeast, Northwest). 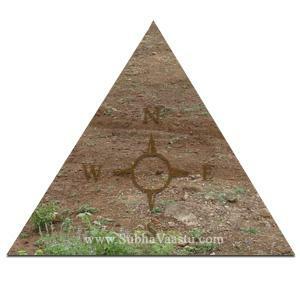 If you are particularly looking for a Plot / Site then search for a good site with vastu principles. If the site/plot is not good according to vastu principles then don't buy it even your horoscope says that direction plot/site is good. Earlier we discussed the sites. The square plot/site is good. Square site means a plot/site which all the directions are equal and at an angle of 90 degrees is considered to be the auspicious site/plot. Ancient literature also states that the heavenly Vastu Purusha which is a spirit and in the form of a human body may be best suits or fits in this square plots and all of his body parts are perfect fits and that site leads to all-round success and prosperity and leads good health of residents. Honestly speaking we don't have experience with some plots published below, recently we observed one house in Hyderabad which is almost a diamond in style, construction and looks. We will be happier if we get the complete experiences of inhabitants in that property so that we will recommend others if they feel more comfortable in that property. 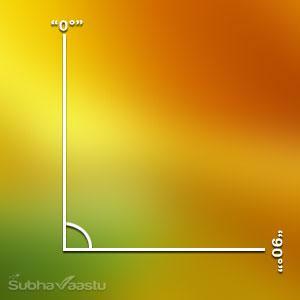 This is 90 degrees plot, there is only South and West walls shown for readers understanding purpose. The corner that is Southwest is 90 degrees. We may observe such 90° sites in many parts of our living areas. Generally, 90° plots are providing good results, if there is any mistake in terms of placing the Main Door, this 90° may not be cruelly punishing the residents. If the site is 120° then problems may arise. In our website, we will discuss all such features of the many common degrees available plots. Now check the below image. All corners are 90 degrees. This plot/site is having 90 degrees in all corners/ angles. Each and all corner shows with corner border and 90 degrees. Southwest, Southeast, Northwest, Northeast all corners are 90 degrees site. No extensions or no depressions on any corner. This is perfectly called as a square plot. Generally, this plot/site leads to all around health and wealth. Generally, the plots/sites in which the opposite sides or other sides may be equal and the corners or angles are 90 degrees are also considered to be the auspicious properties. 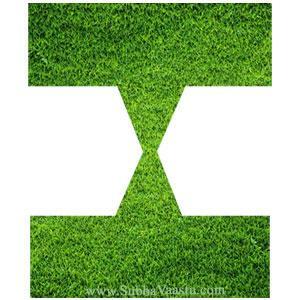 In rectangular plots/sites there is two types, one is East-West rectangular and North-South rectangular plots/sites. The ideal proportion of the site of length and breadth is 1:2. In some rectangular plots, there is a vary in proportion, or very narrow rectangular plots are not said to be the good ones. Just like they may be like a train bogie or stretched corridors. There are male rectangular sites and female rectangular sites are there. If the East-West length is more than North-South this could be called as Male sites / male rectangular sites/plots. So when you would like to select the rectangular shape property, then take care to see that the length has a North-South spread and the breadth has an East-West spread. In other words, the East and West directions should be longer than the North and South Directions. Male sites or rectangular sites means the East-West measurement is more than the measurement of North-South directions. See these North-South directions measurements are more than the East-West directions, this is called as the female site or female rectangular site. We may clearly observe the difference between the measurements of all directions. This rectangular site / plot measurements, East-West measurements are more than North-South measurements. This is called as Male site. This is auspicious site / plot. 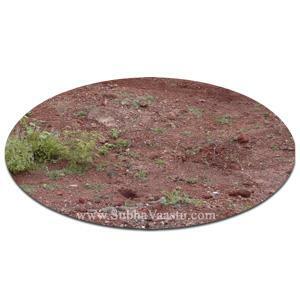 Round shared or Circular sites / plots are not auspicious for residential purposes. One should not construct the house in this round shared plot. Please note that in some areas the constructions are not giving bad results though the circular shape is there, it is because there may not be constructed compound wall. If compound wall constructed to this site, then good or bad results starts. When there is a compound wall, then this site is not at all suitable for the residential means. 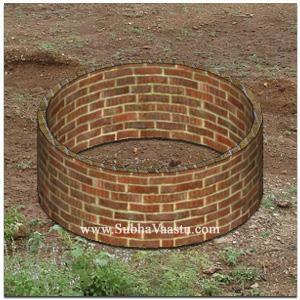 Now observe the round shaped compound wall, this property is not good for residential constructions. 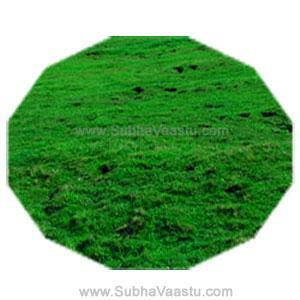 Circular or round shaped constructions may be good for commercial properties or constructions, provided if the construction is also round shaped, then it may be auspicious. 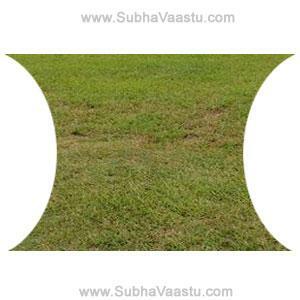 Round shaped plots or round shaped constructions are not auspicious as there is a loss of Northeast corner. Latest sayings and modern Vastu Experts are also opinion the same. 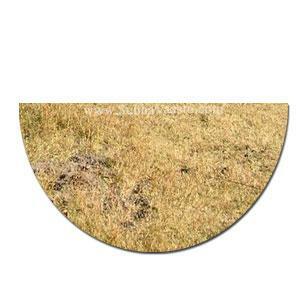 We can find such round shaped constructions like playing stadiums, Parliament House etc. Here we should observe one thing, is the construction is also round shaped or square or rectangular shaped then good results may be expected. If the construction is also round shaped then growth of wealth and knowledge observed. At any cost rectangular or round shaped should not be constructed here. These oval shaped properties may be good for religious structures. We have not find such exactly oval shaped properties in our researches. Through only books we thought that such properties may harmful and brings losses. Any way house construction in this oval shaped compound premises is not at all good. This is triangular plots, there are some more triangular plots, check below. Rectangular shape towards North direction. Construction in this plot may leads to many tensions, fire accidents, disputes, defame to the residents, particularly losses and progeny lost, loss of successors, disciples etc. Generally this property attracts negative energies on the site or residents. 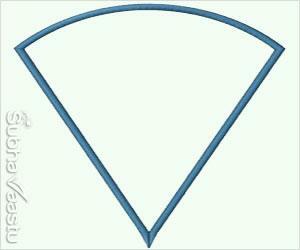 Equilateral Triangular and non Equilateral triangular shapes are also there. Observe the difference from the above one. This is also a triangular shape plot, but pointer is towards East. 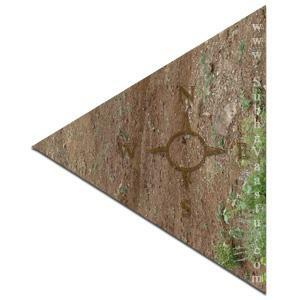 Just like there is another two more triangular shaped plots. Or we may not treat the head and tail of such triangular properties here. All three corners may be head or tail. 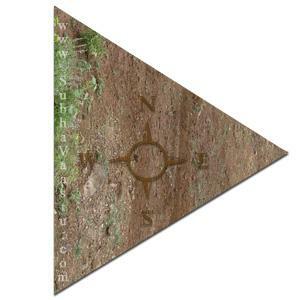 This Triangular plot head is pointing towards South direction. Or we may not treat the head and tail of such triangular properties here. All three corners may be head or tail. This is also one Triangular shaped plot, faces towards West side. Or we may not treat the head and tail of such triangular properties here. All three corners may be head or tail. 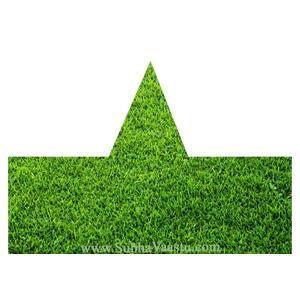 This angle shaped plot is known or called as angular Shaped site. Based on the road which this property has and may provide mixed results to the residents. Measurements are also considered when evaluating the results of this site. Please note that for any plot or site or house we should check the site shape, house plinth shape, road formation, drive way etc then only we have to evaluate the results. Anyway the shape of the site is also too important. This is pentagon Shape property. This will have 5 sides. One Mr. Nagesh got this type of property, he avoid this property only because of, it is having West road, if he built the house then it will become West Facing House property, some body suggested him to sell it. If this property is in India, that may be different, but it is in USA country. Vastu in USA has some limitations that many vastu experts knows. 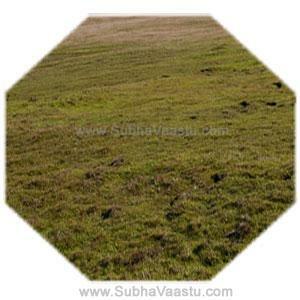 This plot / site is called as Hexagonal site / plot. Rarely we can find such type of plots. Six corners and all corner sizes are equal. Some says this plot may renders good results, but as we heard that this plot is not giving good results, but we did not have any experiences with such plots or sites. Please note that this is the subject which shows the plots and their shape names and it is for the purpose of knowing information. This is having 6 sides. This is Heptagon shaped, 7 sides plot. 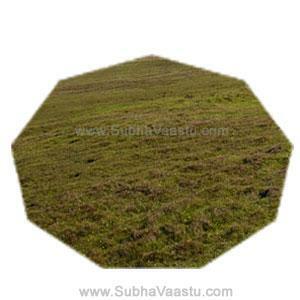 This plot is also having six shapes or corners, which is called as Octagonal shape plot / site. This is total 8 sides property. This is nonagon Shape, it has total 9 sides. This is decagon Shape, it has total 10 sides. This is Undecagon Shape, it has total 11 sides. This is Dodecagon Shape, it has total 12 sides. General sayings said that this plots are good for residential houses. But it is not good for commercial complexes or constructions. It is said to be the front portion is narrow and rear shape is broad. Here the road is towards North. Then it is said to be Gomukhi plot or site. If the road is came towards South then it is said to be Shermukhi. Let we will discuss below. Or the front shape is wider than the rear shape. See below. Some says that this is Visambag / VishamBhag plots and not suitable for any construction. 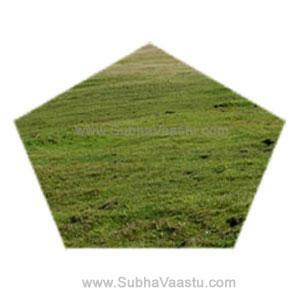 This shape of land is called Shermukhi or Singh Mukhi or Shermukhakar or vyagramukhi plots/sites or Lion shaped plot or site. 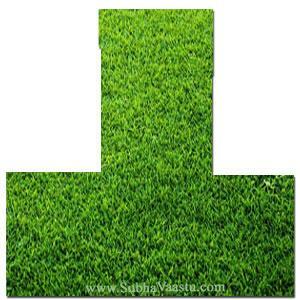 Plots which are broad in front and narrow in rear or back side called as Sher mukhi. Sayings said that these plots are good for commercial purposes and not suitable for residential houses. This is just opposite to the Gowmukhi sites/ plots, that you may compare with the above image. Some says that this is also called as Tabla Plot, it seems to be the shape is like that style. In some places the plots may be two types, one part is very light and another part is heavier. The site is diagonally divided equally into two parts, one part is said to be Northeast and another part is said to be Southwest part. The Northeast part is Sun portion and Southwest part is Moon portion. The Sun portion is lower and shines and Moon part portion is dark and heavier. Generally these properties are not seen. But just like these plots we can find the sites which have elevated towards Southwest and depression towards Northeast sides. 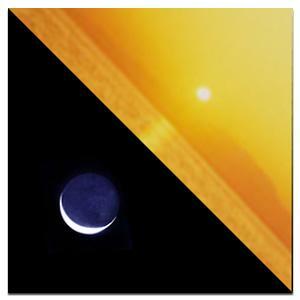 This site is not a familiar in society, many people does not know about this Sun and Moon site. Very rarely this word is used. This is called as cart shaped plot / site. Which is not giving good results to the residents. We have some experiences with this type of properties, but those are not sharp one as shown in this image. Below is the plot. which is T shaped plot. 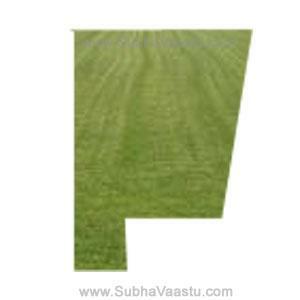 This is double cart shaped plot, or reserved plot. This is not auspicious plot. Some body says that reverse "H" shaped plot. 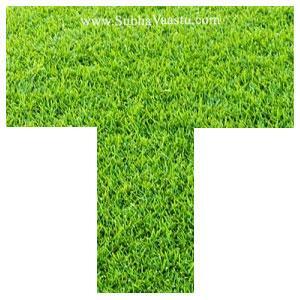 This is "T" shaped plot or site. This is not auspicious plot. Residents may not expect good results from this property or House. 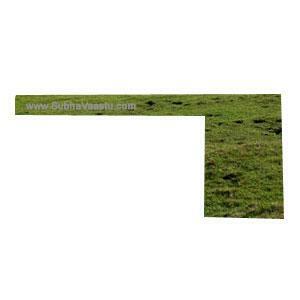 This is reserve "T" shaped site or plot. Which always gives painful results to the residents. Some times this property may bless with unbelievable good results to the inhabitants and finally made them as a looser with negative results. 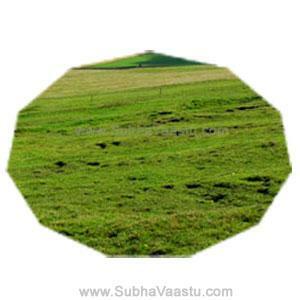 This is semi circle or half circle land / site / plot. Bow shaped plot / site. This site may not develop good relation with others. This is mridanga shaped plot. This is looks to be hand fan shaped style. Already we discussed about the direction of the site or plot, if the tile is facing towards a direction, we can easily predict the results of a site. 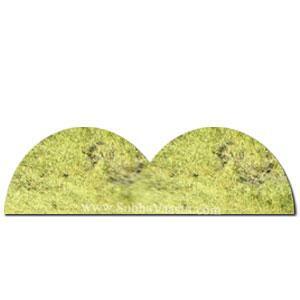 If this tile came towards down this may be called as a flag shaped land. Some may ask the question that they are interested to buy a plot like hand fan shaped, shall we fix that they are searching for this same diagram shaped property, no, there are lots of other style in this only one hand fan shaped property. Now check the below image. Some body asked question that, sir, ours is a hand fan plot, where to place the kitchen, bedroom etc, to answer their question, we should require some more information, check the image herewith, plot is hand fan shaped, where is the tail and head and which direction is the head etc, its very important to explain, then only others will understand. How many shaped or styles now. Now we are discussing only directional plots, if we check the skewed properties, then they may also filled with another eight or ?? This is Star shaped property. These are very rare properties. But some where some property owners are interested to build the properties like this shape. This is said to be Kakmukhi Shaped plot. This may be also called as Crow shaped plot. Some body have their opinion that, this property is good and residents will be more prosperous. 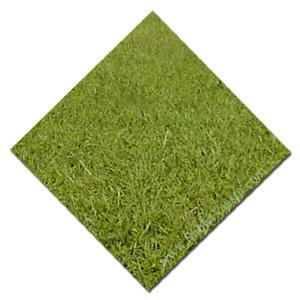 But the shape of the tile and direction is too important to decide the results. In India different shapes of properties may not be popular, but in USA these kind of properties are very common. Mr. Raju told that one Vastu consultant in Dallas expresses his view about different shapes, he opinioned that only rectangular and square shpaed properties are good for living. Is it possible in USA to have only such shaped properties?. 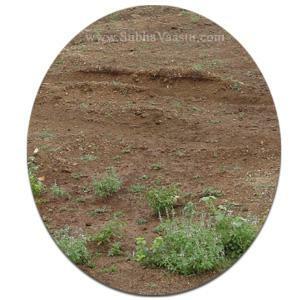 These sites are called as Damarukh or Pathra beeda sites. Broad sides are equal and lengthy sides are curved as shown in the image. This is called as Vardhaka or Virudham or Capsule shaped property. Its a two pairs of parallel sides and a simple quadrilateral parallelogram, as per Euclidean Geometry. It has equal length and has opposite perspective facings. We may found these types of structures or plots in some areas. Based on the direction, the results may be vary. Some times its very difficult, even to the experts to understand the exact structure which are to be defined as Parallelogram properties. Anyway the residents should be very careful before starting the construction. Inhabitants has to invite only experts in this field and obtain the right evaluation for happy and peaceful future. Many experts come across this king structures and warn landlords to have the spectrum thought. This is pie shaped plot. Generally in India we may not seen these kind of sites, but in western countries these type of sites may be available near to the cul-de-sak areas. Most of the times these types of sites may not be good. In some conditions, based on directions and measurements some times these may fetch. Most probably these sites are not auspicious. 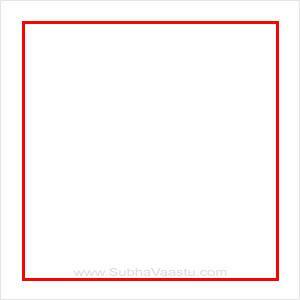 This is a Trapezoid shaped plot. None of the lenghts of sides are same. We have seen these kind of sites, but in western countries, these type of sites may be common. Most of the times these types of sites may not be good. In some conditions, based on directions and measurements sometimes these may be giving good results. 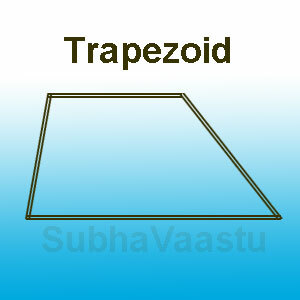 If a resident likes to buy Trapezoid shaped site then without expert vastu consultant don't buy them. Require corrections to the link and more content may also publish, within a short time we planned to do some more additions here. We come across with many irregular shaped properties, we will update with the latest information soon in this/your favorite Vastu Shastra Website. Please note that the square or the rectangular sites are the auspicious when compare with many other sites. 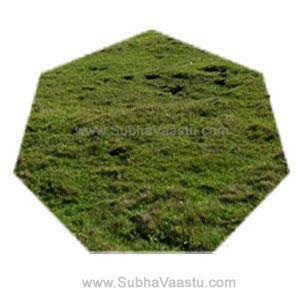 In general, we may easily be understood that in Square shaped plots Panchabhoothas occupied in perfect ratio, and it becomes stable when placed or constructed on the ground. It may easily offers a counter force against seismic forces. Irregular shape constructions or properties may result in uneven distribution of forces thereby leading to damage the property. So we urge the public, before going to buy the land or property, better to approach one best vastu shastra expert consultant nearby you, he will guide you with best recommendations after visiting the property. Is Southwest West street focus home is good? 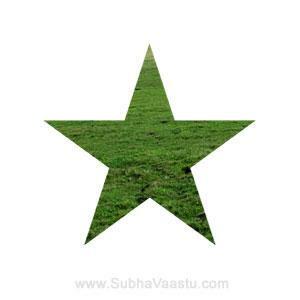 Vastu tips, where can I get vaastu shastra tips? 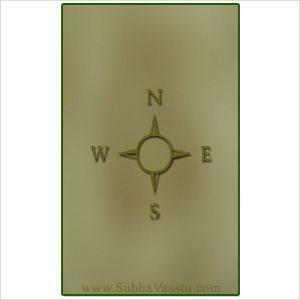 Where can we find best vastu shastra specialist? 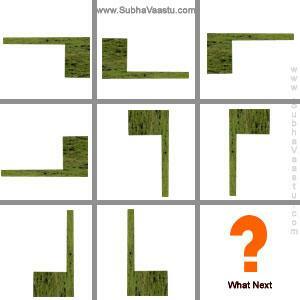 Flats vastu, need to know which flat is good to buy? Is vastu works in Dubai, likes to take one office in Dubai? Can we install Elevator/lift at West direction in our home? Who is the best vastu expert in India, looking vastu advice? Is vastu works in Apartments, some says no, please explain? Who is the best vastu expert in Hyderabad, need consultancy? can you clarify me if the plot direction is west face can we built a house to east face and arrange Main Door entrance towards east direction. size South:36 North : 36 and east:50 west :50 and no road hitings. this is an ECO-Plot means for platation purpose is it good to me holding the plot for long term basis. i purchased this plot only to save nature with planting purpose. please give me your advice. and also say to me is female plots holding by male is good for long term basis for investment purpose. my plot size is 32 x 60 east facing. 32 is facing east. from north of east, 23 feet of my plot there is a street focus. DTCP approved property. street focus road is not used yet. can i build my home here. kindly suggest. pls advice me, i want to do ist floor construction, i bought constructed house, which is north faced front 30feet by 24feet, nd 70feet by 70 feet, main enterance is divided into two part (main gate cover20 feet nd 2nd is shop of 10 feet has dirrerent door, now i wan to know this is still shermukhi ? pls suggest us without demolition,some upayee. Can I go-ahead and buy a west facing plot for construction of a house, with west measuring 39 Ft. x East 41 Ft., North and South measuring 60 Ft each, in a layout in Bangalore. Sir I am ambuja we want to know whether we can construct a house from left land to top right east facing is road. So devamulay is empty we want north east facing as main door. It is actually 30*40 site we occupied only left site of site. We have NA plot of 3 guntha. Having diamond shape. Is preferable to buy this plot? The plot is 90 degrees on south east. 60 degrees on North and south. The plot tilted 15 degrees towards southwest. I want to buy this for some good cause. Please help. Hello sir, I am having right angled triangle piece of land on which I want to make home for my self and 5 cousins. I am unable to decide how to should I cut a pot and make house. I am showing interest in a flat (apartment)havi ng 6corners.flat is east facing.is it advisable?